For the last two months, we’ve been visiting wineries for our forthcoming DO Montsant guide to be released next Spring. 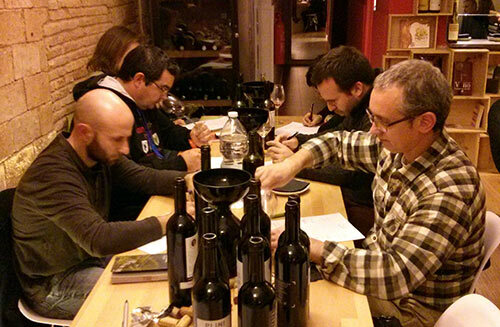 In doing this, we’ve received several hundred bottle samples for tasting notes and we’ve enlisted the professional aid of several sommeliers in Barcelona to help us work through this and write up the wine details. We conducted our first session last week at the new, wonderful wine bar in the Poble Nou neighborhood of Barcelona called, MésDVi. We’d like to very much thank Xevi and David for letting us take over a large section of their bar for several hours while the six people on our panel honed in on analyzing this first batch of samples. For anyone who stops through Barcelona, we highly recommend paying a visit as they have frequent tastings and activities, their wine changes each month and these two guys know how to pick some great bottles. The first batch of sommeliers in attendance were a group we’ve met over the last year via wine events and we respect a great deal. They were as follows: Carlos Álvarez, Dani Garcia, Eric Vicente, Ramón Roset, Victoria Ibañez, and Xavier Bassa. Many thanks to all and we look forward to seeing everyone at Round 2, happening soon.